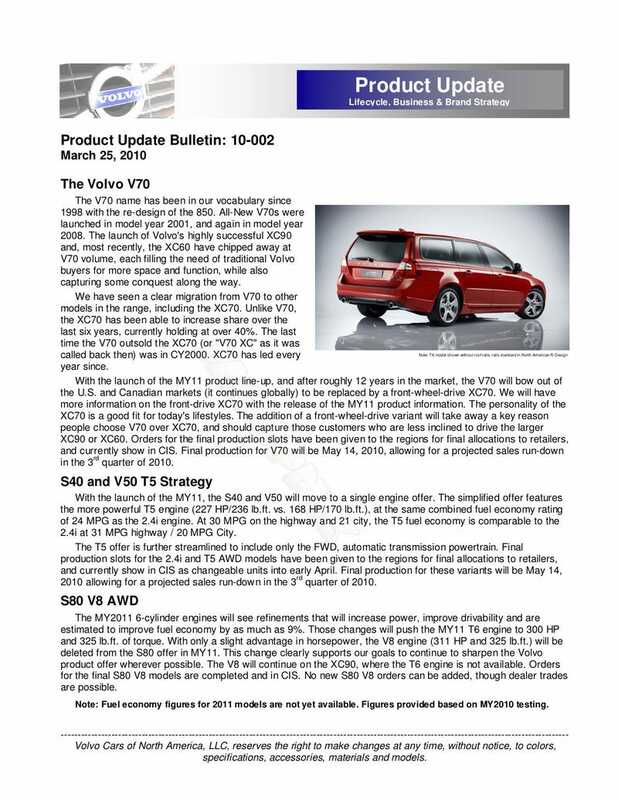 According to this leaked Volvo dealer product update, the V70 wagon's getting the axe after 11 years of production. The V8-option in the S80's also going bye-bye and the V50 wagon's not long for this world. Chalk it up to internal competition at the Volvo brand, but the V70 just can't hack it against the much more popular and aggressive XC70. The V70's lost the sales race against the XC70 since 2000 and hasn't made any headway in market share either. Combine the weak performance of the regular wagon with the installment of the new XC60 and it no longer makes sense from Volvo's perspective to keep the V70 around. Sadly, it's going to be axed from the North American market in 2011. To amends the product lineup Volvo will be offering the previously XC70 soft-roader in a watered-down FWD option. In other news, the product update document tells us the S80 will be getting an upgraded T6 engine packing 300 HP and 325 lb-ft of torque and get as much as 6% better fuel economy, all points making the V8 delivering 311 HP and 325 lb-ft of torque redundant. It'll be dropped from the S80 options list, though remain available in the XC90. Now the V50 is a bit more interesting. For 2011, both the S40 and it's V50 wagon version will be reduced to a single engine offering, dropping the 168 HP and 170 lb-ft 2.4i and only offering the 227 HP and 236 lb-ft T5 engine, though it will be upgraded to match the 2.4i's fuel economy. In addition the T5-equipped cars will only be offered as front-wheel-drive with automatic transmission — no more manual or all-wheel-drive option. We've been told by a Volvo insider the company is very seriously considering killing off the V50 within the next two years as well. All of this completely rearranges our world-view of Volvo. Perhaps Ford's slimming down operations in advance of the sale to Geely to reduce their long-term warranty liabilities, or maybe Volvo's just facing the facts of what the buyers are telling them, but their radically reworked lineup might end up free from traditional wagons and basic engines. It might not be long before Volvo is yet another brand focused on crossovers and SUVs with a couple cars in there to make CAFE regulations. Oh the horror!